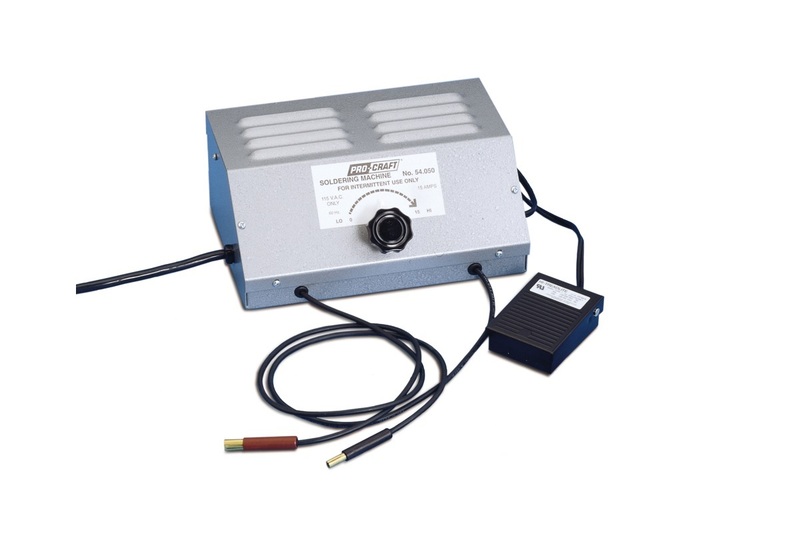 Soldering Kit 220 Volt Electric Soldering Machine With Accessories Heats to 2000°F (1093°C | QTE North America, Inc.
Low-voltage unit is shock resistant - your hands may safely touch any part of the carbon holders or contact clips. You will find this soldering machine easy to use. It is compact and efficient for soldering rings, jewelry, eyeglass frames or any piece where hard or soft solder is needed. The heat range is acceptable for soldering very light to heavy items. Heat control is easily achieved by turning the selector knob. The heat is produced electrically, without flame, by touching a carbon electrode to the work to be soldered. The current passing through the carbon will heat the object in a matter of seconds. Carbons are copper plated to insure good contact. The large carbon holder can be adjusted to use carbons either horizontally or vertically, and is low enough so that both hands may rest comfortably on your bench. Electric soldering machines are also used to demagnetize watch movements, small instruments and small hand tools.